January 4 - February 2 2019: $795/nt. April 24 - May 4: $645/nt. January 5 - March:: $895/nt. April - December 19: $795/nt. 5,000 square foot home for extended family in West Maui. What a great find for extended family! This 5,000 square foot home is centered around a large open floorplan, great room, lanais, spa and pool. Multiple living areas to congregate, and plenty of privacy as well. Located just five minutes from the heart of both Lahaina town and Ka’anapali in quiet residential setting. The Wai Ola Vacation Paradise is a spacious ocean-view home nestled in the foothills of the West Maui Mountains (just 2 1/2 blocks from the ocean.) The residential setting will be appreciated by families looking to escape the crowded resorts, while the location is just a short drive from Maui’s best beaches, golf, shopping and activities. Wai Ola really shines as a whole-house rental for extended families because it was originally set up as a B&B for rental by the room – so every room is it’s own fully private suite. Suites include zoned A/C, living area with TV, private bathroom, coffee bar, fridge and lanai. Guests can easily open the house up wide for everyone to mingle and share time together in the many entertaining areas, lanais or poolside. Just as easily retreat to your private suite when you’re ready for some alone time. Each of the bedrooms also has it’s own private outdoor entrance, king beds and quality furnishings. Furnishings chosen create a relaxing home that you will feel comfortable living in, and the Hawaiian and tropical theme will keep you relaxed inside and out. The entire property has wifi and ceiling fans are everywhere so you can feel free to open up to the luscious Hawaiian breezes at your preference. 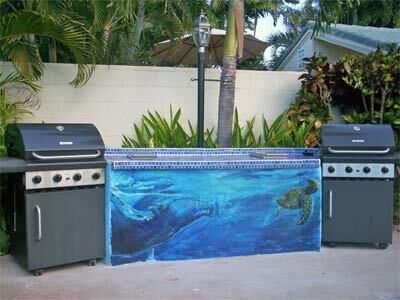 There are two large gas grills by the pool, separated by an island with two additional burners inset. Grilling feasts poolside is mandatory! The heart of Lahaina Town – the most visited destination in Maui – is just over a mile away. Maui’s original resort town of Ka’anapali is just as close in the other direction. World-class beaches, resorts, spas, shopping, activities and golf are all within easy reach. The friendly owner is responsive and lives on-property which is a big plus if you have questions or any needs arise. If you’ve been looking for a family retreat in West Maui, Wai Ola is a superb option. Our family of 11 stayed here from Oct 25th to Nov 7, 2017. This home is beautiful. We rented the whole house and had one of the best times ever while on vacation. For 9 of us it was our first time in Hawaii and I can see now why most people come back. Karen is the property manager and she is absolutely wonderful. Answered questions, gave us some great info as to where to go to see the most amazing things that Maui has to offer. Beautiful beaches, sunsets and sunrises. Can’t wait to come back.